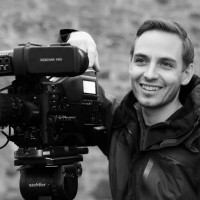 I am an experienced camera operator and a BAFTA New Talent winning filmmaker. I offer over eight years experience filming for global brands, live broadcast, documentary and natural history. As a freelance camera operator I have worked for the main UK broadcasters – BBC, ITN, Channel 4 and Channel 5 for both news and features. International broadcasters include PBS, Arte, Tele Madrid and the Smithsonian Channel. Branded content includes Heineken, Adobe, Red Bull and Visit Britain. Filming sequences for Exposure in Scotland at the home and office of our principal subject Alex Renton. Production Title: Trump & Britain: Love or Loathing? I have shot several days with KEO Films as gimble operator, B-cam operator and self-shooting pick up and B-roll for the series. 3 days shooting for ITN filming HRH Prince Charles at Dumfries House and interviewing contributors near Balmoral Castle. Working at the Media Centre, the Scottish parliament and on location on the Royal Mile I filmed on various ENG cameras for various European TV stations including Antena 3, Arte, Tele Madrid, Telecinco, RTVE, PRVA, 8TV and LaSexta. Aidan Moffat tours and explores the story telling traditions of Scotland as part of the 2014 Commonwealth Games Cultural Programme. Ryan is a superb camera op and a pleasure to work with. His rushes were excellent. We had an abundance of quality shots to pick from. It made our life in the edit very easy. In what were jam-packed filming days, his work ethic was second-to-none as well. Ryan was quick to offer imaginative shots when we needed them and he went the extra mile to achieve them.